PolyK has built a comprehensive test center that can integrate fundamental polymer and thin film characterization with high voltage and dielectric test. We offer flexible test services to various customers to fully utilize the potential of our unique characterization techniques with reasonable cost. All equipment is fully calibrated and all test will be performed by our experienced engineers with at least three-year direct experience on relevant test. High voltage and dielectric measurements are very specialized test. Many people do not have experience and they may make all kinds of mistakes: they do not know whether the equipment is working or not, they use wrong settings or wrong fixtures, few people is willing to ready the equipment manual carefully. Therefore even though the modern computer-controlled test systems can always provide you a number, many test results may not be correct. PolyK engineers have many years experience in these tests. They are true experts in the test equipment and they always know how to get the most reliable results. They also use commercial materials with known performance to calibrate the test system. Therefore, you can always trust the test results provided by PolyK. DSC (TA Q2000, Differential scanning calorimetry , -90 C to 500 C): $100 set up fee, $60/sample (including sample preparation using METTLER TOLED balance with 1 microgram accuracy). Will run a free standard based on customer's requirement before running samples (Indium, Zinc, or Lead). Additional fee may be charged if each run is longer than 4 hours. Modulated DSC can be run based on special requirement. DMA (TA Q800, Dynamic Mechanical Analysis, liquid )nitrogen cooling): $200 set up fee, $120/sample. Additional fee may be charged if the run takes long time or consumes too much liquid nitrogen. FTIR (Fourier transform infrared spectroscopy, only transmission): $40/run, or $100/hour. Dielectric Breakdown and Polarization (ferroelectric) loop test: $120/hour (+/-20 kV). Sample preparation fee may apply (thickness measurement down to 0.1 um with Heidenhain gauge). High temperature measurement fee may apply. High voltage resistivity/leakage current (10 kV, up to 250 C, single layer film or large size capacitor): $100 set up fee, $60/hour. Sample preparation fee may apply. Liquid nitrogen fee may apply if run at low temperatures. Capacitance and dissipation factor test vs temperature and frequency (20 Hz - 1 Mhz, -100 C to 250 C): $200 set up fee, $60/hour. Sample preparation fee may apply. Additional liquid nitrogen fee may apply based on test requirement. Thermal conductivity test (TCi system): $100 setup fee, $100/run (three spots on the same specimen). High temperature fee may apply. Capacitor charge-discharge test: with high current MosFET switch: $200/hour. Charged energy may be provided for certain samples. Film extrusion service (15 cm die, 1" single screw extruder, up to 320 C): $500 set up fee, $1,000/day. Special fee may apply if requirement thorough cleaning. Machine shop user fee: $100/hour (high power laser, band saw, diameter wire saw, and others). DSC with TA Q2000 (modulated), -90 C to >500 C.
DMA with TA Q800 (tensile or bending), with liquid nitrogen cooling. 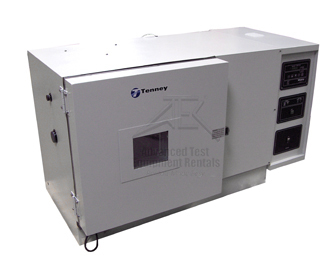 FTIR (400-8000 cm-1), polarizer and temperature control are available. Intrinsic viscosity (molecular weight) of polymer dilute solution using Cannon-Ubbelohde glass viscometer. Instron mechanical test (available in 2016). Thermal conductivity measurement (details available upon request, four technologies available). Electrode deposition using either sputtering (Gold, silver, or platinum) or thermal evaporation (Aluminum or gold). PolyK has various masks for electrode deposition. Accurate thickness measurement using either mechanical gauge (0.2 um and up) or optical system (1 nm to 5 um). Drying ovens: vacuum oven with temperatures up to 500 deg C, over ten gravity and forced air ovens. Solvent casting (we have chemical lab with fume hood, film casting in clean gravity oven on glass slides up to 18" by 18"), various organic solvents available. Filtration system from ml to several gallons with filter pore sizes from 0.1 um to 10 um. Melt extrusion (6" or 18" flex-lip die, 300-450 deg C). Thin film stretching (batch process or roll-to-roll). Capacitance (dielectric constant) and dissipation factor as a function of temperature (-100 deg C to >1,000 C) and frequency. Agilent/HP/Kesight 4284A (20 Hz to 1 MHz) and 4285A (75 kHz to 30 MHz). Leakage current test as a function of temperature and/or voltage. Dielectric breakdown test with voltage up to 125 kV (as a function of temperature). Polarization loop and ferroelectric test as a function of temperature, frequency, and voltage. Capacitor charge-discharge test (voltage up to 20 kV, discharge speed down to 1 microsecond, current up to 5,000 A. Export control or ITAR may apply.). High voltage poling (various voltage and temperature). High voltage aging (DC or AC). TSDC thermally stimulated depolarization current. Pyroelectric coefficient test (with Keithley 6517A electrometer). Capacitance and dissipation factor under high voltage DC bias (vs temperature and frequency). Capacitor equivalent series resistance (ESR) and equivalent series inductance (ESL). Other high voltage, dielectric, or ferroelectric test: we are specialized in these test and we can easily combine several meters together to help you. Piezoelectric energy harvesting measurement system with VTS 100 lb shaker and HP dynamic analyzer (pictures at the bottom of this page). All high voltage and dielectric test can be performed by comparing commercial materials such as Kapton, PTFE, polyetherimides, PEEK, PPS, PEN, PET, or biaxially oriented polypropylene (BOPP). As these tests are strongly affected by the test equipment and protocols, PolyK recommends comparable test shall be performed on commercial competing materials so the results are more meaningful. PolyK has all these commercial materials for this purpose. We can provide competitive analysis based on the above test results and compare their performance with commercial competing materials or technologies. With our comprehensive polymer analysis tools and high voltage test tools, as well as our experience with almost every commercial polymer material, we can also help you to identify the composition of the samples your provided. ABB 100 kV power supply. Keithley 2410 Sourcemeter (1.1 kV/2A). Keithley 2657A Sourcemeter (3 kV). PolyK has the capabilities to design control units and LabView program to integrate various test equipment into an automatic test system to perform high voltage, dielectric, and sensitive weak signal test as a function of temperature, voltage, time (aging), and cycles. Some of our aging tests take over three months to complete. Keithley 6517A electrometer (two units). Keithley 6485 picoammeter (two units). HP 4140B picoammeter (three units). HP/Agilent 4284A (five units, 20 Hz to 1 MHz, calibrated by Keysight). Agilent/HP/Kesight 4285A (75 kHz to 30 MHz). Hewlett Packard 3577A Network Analyzer, 35677A S-Parameter Test Set. Hewlett Packard 35670A 4 channel FFT Dynamic Signal Analyzer. TA DSC Q2000 with autosampler (modulated), Analytical Balance with accuracy of 0.001 mg. Evaluate the flexibility/ductility of thin capacitor film and feasibility of film and capacitor winding: Electronic counter up to 9,999,999 folding. Folding distance and speed adjustable. Thickness Gauge with accuracy of 0.1 um. With computer control, 600 mm by 900 mm stage, for cutting plastics and wood to produce test fixtures. Vacuum Oven with temperature up to 500 deg C! Door rubber gasket cooled by water, used for processing polyimides and nanocomposites. Polymer dilution solution intrinsic viscosity (molecular weight) measurement following ASTM Standard D2857 using Cannon-Ubbelohde viscometer. STX-603 is a CE certified precision diamond wire saw is designed to provide smooth cutting or slicing for all kinds of materials, especially for larger size crystals, such as Si, Ge, and GaAs, etc., up to 6" (155 mm) diameter. It cuts the crystal by a diamond impregnated wire (0.28 mm diameter) which moves repeatedly backward and forwards with the help of a digital controller. STX-603 is equipped with an adjustable sample holder with three angles. Other tools include optical microscope with digital camera, various masks for metallization, etc.